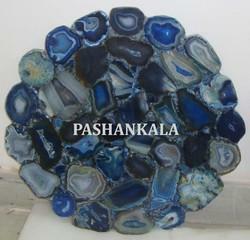 - Widely demanded in malls, hotels, restaurants, etc. As, we have an extensive distribution system; we can gratify patrons by fulfilling massive requirements and making delivery as per schedule. Staffed with latest machines and leading technology, we make certain that the material we use is as per the stated norms and meet the international standards. 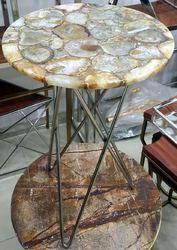 We offer high quality of Wild Agate - Table Top. With fully merar polished, 20 mm thickness , available in multi colour & multi size 16", 18"and 20". One side polished.